Picked up this neat trick on YouTube. Prepare rice like you normally would (in a rice cooker). 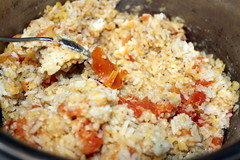 I like to add red lentils in my rice. Add one whole tomato in the middle. Add a drizzle of oil. 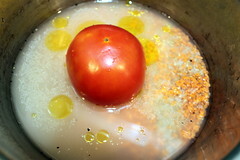 Once cooked, break up the tomato and stir it in the rice. It’s easy and delicious!